Russia had made considerable economic progress during the early years of the 20th century. By 1914 Russia was was annually producing some five million tons of pig-iron, four million tons of iron and steel, forty tons of coal, ten million tons of petroleum, and was exporting about twelve million tons of grain. However, Russia still lagged a long way behind other major powers. Industry in Russia employed not much more than five per cent of the entire labour force and contributed only about one-fifth of the national income. Sergei Witte realised that because of its economic situation, Russia would lose a war with any of its rivals. Bernard Pares met Sergei Witte several times in the years leading up to the First World War: "Count Witte never swerved from his conviction, firstly, that Russia must avoid the war at all costs, and secondly, that she must work for economic friendship with France and Germany to counteract the preponderance of England." 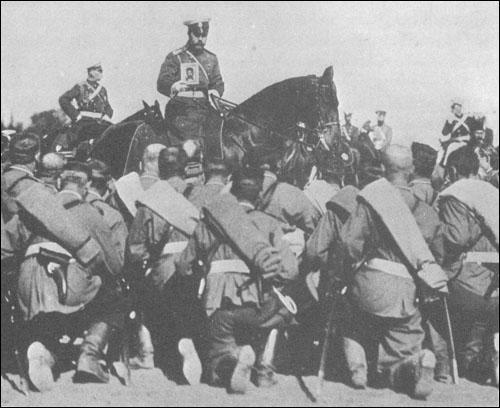 In 1913, the Tsar Nicholas II approved a "great army programme". This included an increase in the size of the Russian Army by nearly 500,000 men as well as an extra 11,800 officers. It is claimed that Russia had the largest army in the world. This was made up of 115 infantry and 38 cavalry divisions. The Russian estimated manpower resource included more than 25 million men of combat age. However, Russia's poor roads and railways made the effective deployment of these soldiers difficult and Germany was confident in being able to deal with this threat. On the outbreak of the First World War General Alexander Samsonov was given command of the Russian Second Army for the invasion of East Prussia. He advanced slowly into the south western corner of the province with the intention of linking up with General Paul von Rennenkampf advancing from the north east. General Paul von Hindenburg and General Erich Ludendorff were sent forward to meet Samsonov's advancing troops. They made contact on 22nd August, 1914, and for six days the Russians, with their superior numbers, had a few successes. However, by 29th August, Samsanov's Second Army was surrounded. General Samsonov attempted to retreat but now in a German cordon, most of his troops were slaughtered or captured. The Battle of Tannenberg lasted three days. Only 10,000 of the 150,000 Russian soldiers managed to escape. Shocked by the disastrous outcome of the battle, Samsanov committed suicide. The Germans, who lost 20,000 men in the battle, were able to take over 92,000 Russian prisoners. On 9th September, 1914, General von Rennenkampf ordered his remaining troops to withdraw. By the end of the month the German Army had regained all the territory lost during the initial Russian onslaught. The attempted invasion of Prussia had cost Russia almost a quarter of a million men. Again that cursed question of shortage of artillery and rifle ammunition - it stands in the way of an energetic advance. If we should have three days of serious fighting we might run out of ammunition altogether. Without new rifles, it is impossible to fill up the gaps. The army is now almost stronger than in peace time; it should be (and was at the beginning) three times as strong. This is the position we find ourselves at present. If we had a rest from fighting for about a month, our condition would greatly improve. It is understood, of course, that what I say is strictly for you only. Please do not say a word of this to any one. I cannot find words to express all I want to, my heart is far too full. I only long to hold you tight in my arms & whisper words of intense love, courage, strength & endless blessings. More than hard to let you go alone, so completely alone - but God is very near you, more than ever. You have fought this great fight for your country & throne, alone & with bravery & decision.... God will give me the strength to help you, because our souls are fighting for the right against the evil… we, who have been taught to look at all from the other side, see what the struggle here really is & means. You showing your mastery, proving yourself the Autocrat without who Russia cannot exist. It will be a glorious page in your reign & Russian history, the story of these weeks & days & God, who is just & near you, will save your country & throne through your firmness… God anointed you at your coronation. He placed you where you stand & you have done your duty... Those who fear & cannot understand your actions will be brought by events to realise your great wisdom. It is the beginning of the glory of your reign. He said so & I absolutely believe it. Your Sun is rising & today it shines so brightly. And so will you charm all those great blunderers, cowards, lead astray, noisy, blind, narrow-minded & false beings… Don’t doubt - believe & all will be well & the army is everything - a few strikes nothing, in comparison, as can & shall be suppressed. The left are furious because all slips through their hands. Most gracious Sovereign. Do not find fault with us for appealing to you boldly and frankly. Our action is dictated by loyalty and love for you and our country and by our anxious recognition of the menacing character of what is happening around us. Yesterday at the meeting of the Council, at which you presided, we unanimously begged you not to remove Grand Duke Nicholas from the High Command of the Army.... We venture once more to tell you that to the best of our judgement your decision threatens with serious consequences, Russia, your dynasty and your person. Although they had some successes against the Austrians, defeat by the Germans soon led to rout. Most of Poland was lost to Germany in 1915.... Success in the modern form of warfare lay with the industrial nations of the world, who were able to mass-produce up-to-date weapons and ammunition and who had an efficient network of road and rail communications. Russian industry simply could not keep pace with demand. By 1915, many of the frontline soldiers were without guns; they had to wait for colleagues to tall so that they could pick up theirs. There were instances of soldiers being issued with only four bullets a day! The transport system was totally inadequate. Most of Russia's railways were in the west and soon fell into enemy hands; lorries were in very short supply and horse transport was often till that remained. Many of the horses had been requisitioned from the peasants, who thus found themselves without animals to help farm the land. Russian Officer: Why these fortifications, your majesty? Surely the Germans will not get this far!. The Tsar: But when our own army returns....? 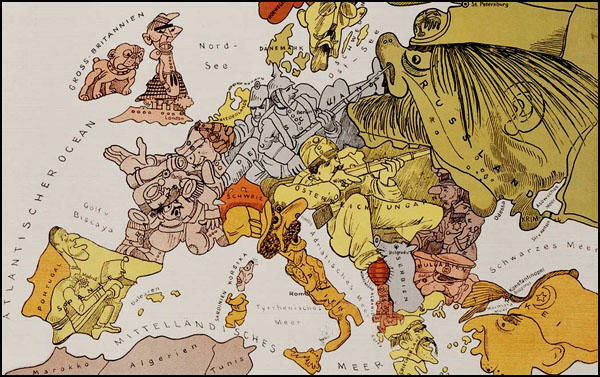 1915 was a year of crisis. 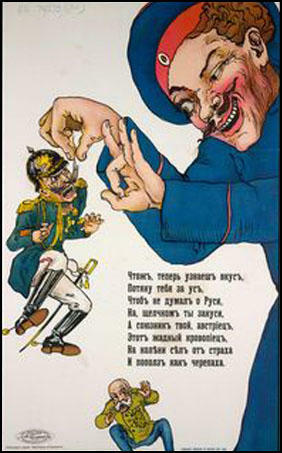 The Russian armies had failed to win a quick victory in 1914, and German and Austrian counter-attacks had deprived the Russians of much of the territory that they had gained in the early months of the war. The enemy had occupied a large area of Russian Poland. 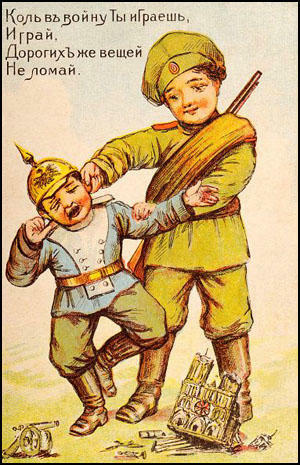 The Russian forces were hampered by a shortage of shells and rifles. In July 1915 the Tsar decided to take personal command of the armed forces in the place of his uncle, the Grand Duke Nikolai. This was a mistake. Nicholas II had little military experience and, as commander, he was held personally to blame for every defeat. His new responsibilities kept him away from Petrograd and the day to day business of government was left in the hands of the Tsarina and Rasputin. The Tsar was bombarded with nagging letters from his wife, who insisted that he follow Rasputin's advice and ignore the suggestions of the Duma. Rasputin, like Nicholas, believed that the Tsar should wield supreme power. Many of the men who were, on Rasputin's advice, promoted to important government positions were incompetent. The year 1915 was a very difficult one. The troops at the front were short of arms and ammunition ... discontent was growing. There was especially bitter feeling against the Empress. She was of course German by birth, and rumours went round that she was working for the Germans against Russia. These stories were quite untrue, but people believed them. What was true, however, was that the Empress was entirely under the influence of the disreputable Rasputin, and on Rasputin's advice was pressing the Emperor to appoint corrupt and incompetent men to the most important posts in the government. For the present, I have data only for one village, that of Grushevka. The figures are: 115 (10 killed, 34 wounded, 71 missing or in captivity) out of 829 souls mobilized. Consequently, for the village of Grushevka the losses amount to 13 per cent of the total population of 3,307 souls, of whom 829 souls were in the army. In the village of Grushevka alone, more than five hundred petitions have been presented by widows, wives, mothers of soldiers in active duty. They are getting allowances regularly, but the widows of the killed soldiers decorated with the order of St. George have thus far received nothing. ... We have also a goodly number of refugees: the largest percentage comes from Kholm guberniia, but there are also refugees from Grodno and Minsk guberniias.... Harvesting and threshing are going on everywhere, and there is hope that the work will be finished on time in the fall. In addition to women, children, and the aged, I have working for me 36 people from the Kherson jail, and 947 Austrian war prisoners. By November and December 1916 food prices were four times as high as before the war and these months were exceptionally cold even for a Russian winter. Strikes for higher wages and demonstrations for bread became common in Petrograd and Moscow.... On 11th March, 1917, troops still loyal to the Tsar fired on demonstrators in Petrograd. It is not known how many were killed... On the following day almost every soldier in Petrograd joined the demonstrators. Question 1: Study sources 1, 4, 6 and 8. Explain the opinion of the cartoonists towards Russia and the war. Question 2: Why does Tsar Nicholas II finish off his letter (source 2) with the words: "Please do not say a word of this to any one". Question 3: Study source 4. What is meant by the phrase "your decision threatens with serious consequences, Russia, your dynasty and your person". Question 4: Explain why the Tsar's ministers (source 5) were concerned about him becoming commander in chief of the Russian Army. Question 5: Use the information in the sources to give as many reasons as possible to explain why so many Russian people were unhappy by the beginning of 1917.